This protocol describes a detailed method for the long-term ex vivo culture and live imaging of a Drosophila imaginal disc. It demonstrates photoreceptor differentiation and ommatidial rotation within the 10 h period of live imaging of the eye disc. The protocol is simple and does not require expensive setup. Tsao, C. K., Ku, H. Y., Sun, Y. H. Long-term Live Imaging of Drosophila Eye Disc. J. Vis. Exp. (123), e55748, doi:10.3791/55748 (2017). Live imaging provides the ability to continuously track dynamic cellular and developmental processes in real time. Drosophila larval imaginal discs have been used to study many biological processes, such as cell proliferation, differentiation, growth, migration, apoptosis, competition, cell-cell signaling, and compartmental boundary formation. However, methods for the long-term ex vivo culture and live imaging of the imaginal discs have not been satisfactory, despite many efforts. Recently, we developed a method for the long-term ex vivo culture and live imaging of imaginal discs for up to 18 h. In addition to using a high insulin concentration in the culture medium, a low-melting agarose was also used to embed the disc to prevent it from drifting during the imaging period. This report uses the eye-antennal discs as an example. Photoreceptor R3/4-specific mδ0.5-Ga4 expression was followed to demonstrate that photoreceptor differentiation and ommatidial rotation can be observed during a 10 h live imaging period. This is a detailed protocol describing this simple method. The Drosophila larval imaginal discs have been a favored experimental system for the study of a wide variety of biological mechanisms. These discs invaginate from the embryonic epithelium and become sac-like structures built up by two epithelial layers, Peripodial Epithelium (PE) and Disc Proper (DP)1,2. The imaginal disc cells proliferate and progressively differentiate during the larval and pupal stages and eventually develop into the adult body structures. Due to the flat and simple two-layer structure of the imaginal discs, they are easy to observe when dissected from larvae. However, despite several efforts by many groups, the current methods for the long-term culture of the imaginal discs have not been satisfactory. We have recently developed a culture method that can sustain the normal development of multiple imaginal discs for up to 18 h and that allows live imaging3. The culture method can support cell differentiation and migration, but it can support cell proliferation for only 7-12 h and cannot support disc growth. The major difference in the culture medium is the high concentration of insulin3. The method is simple, and no special aeration or medium circulation is required. One of the best-studied imaginal discs is the eye-antennal disc. The Drosophila eye is built up of approximately 800 ommatidia. Each ommatidium is comprised of eight photoreceptor cells (R1-R8). In the larval eye disc, the photoreceptor cells differentiate following the passage of the Morphogenetic Furrow (MF), which sweeps across the eye disc from posterior to anterior4,5. The photoreceptors in an ommatidium differentiate in sequence, beginning with R8, followed by R2/R5, R3/R4, R1/R6, and R76. The ommatidia in the dorsal and ventral halves of the eye disc undergo a 90° rotation in opposite directions, resulting in opposite chirality7,8. The rotation process occurs in two stages: first, a 45° rotation begins at and is completed at the sixth ommatidia row behind the MF; the second 45° rotation is completed at about row 169,10. 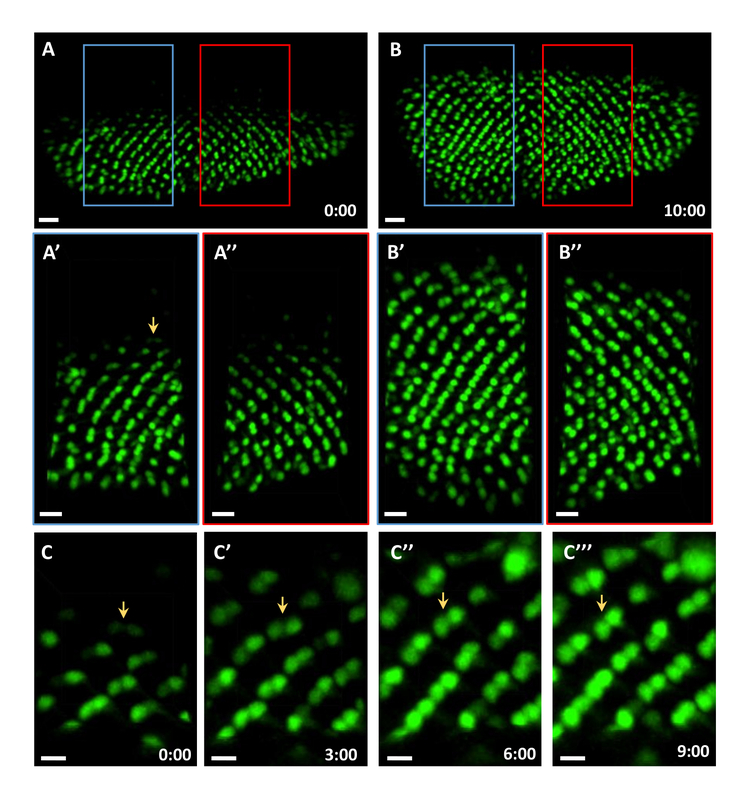 This study used ommatidial rotation, marked by the R3/4-specific mδ0.5-Ga411, to demonstrate the normal cellular differentiation and dynamics that can be observed through this method to culture and live-image the eye disc. Collect a fly egg that expresses nuclear green fluorescent protein (GFP) under mδ0.5-Gal4 and culture at 25 °C for 5 days. Microwave 0.7 g of low-melting agarose in 10 mL of 1x Phosphate-buffered Saline (PBS) until the agarose is completely dissolved. Keep the 0.7% low-melting gel in a 37 °C incubator until use. Sterilize all equipment, including forceps, scissors, 42 mm x 0.17 mm coverslips, a 9-well glass spot plate, and a magnetic culture chamber, with 70% ethanol for more than 12 h.
Prepare the culture medium3: Schneider's Drosophila medium supplemented with 2% Fetal Bovine Serum (FBS), 0.5% penicillin-streptomycin, and 1.25 mg/mL insulin. To avoid contamination, prepare the medium in a cell culture hood. Store the prepared culture medium at 4 °C and used within a month. Clean the dissection platform and the experimenter's hands with 70% ethanol before starting the dissection. Air dry all the equipment from 70% ethanol. Select a third-instar larva from a fly vial. To avoid contamination from the fly vial, wash the larva in 1x PBS 3x to remove the waste. Dissect the cleaned larva in 1 mL of culture medium (at RT) in the 9-well glass spot plate under a dissection microscope. Grasp the larva with a pair of forceps at about one third of the way from the posterior end and another forceps at the mouth hook. Pull the two forceps in opposite directions to release the internal tissues. Remove the salivary glands, fat body, and cuticle from the eye-brain complex attached to the mouth hook. If the ventral nerve cord is still attached, cut it away with scissors. Use one pair of forceps to grasp the mouth hook and one pair of forceps to remove a piece of tissue that connects the brains and eye discs in the dorsal part. NOTE: If this tissue is not removed, the two eye-antennal discs will be close to each other and the brain. The eye discs will then not lie flat on the coverslip because this tissue, the brain, and the eye-antennal disc will form a triangle. Rotate the whole complex to a ventral-upward position. Remove the filament that connects the hook or disc to the brain. NOTE: If the filament is not removed, the eye-antennal disc will split into two piece when the mouth hook is removed. Remove the mouth hook. Take care not to damage the eye disc during the process. NOTE: The eye disc is now free in the medium and only connected to brain by the optical stalk. Air dry and assemble the components of the chamber with a 42 mm x 0.17 mm coverslip. Attach a double layer of O-rings to the center of the cover slip to hold the agarose. Assemble the chamber with coverslip. Put the 42 mm x 0.17 mm coverslip on the stage acceptor. Place the silicon O-ring on the cover slip. Place the base. Lock the sealing locker and place the cover (Figure 1). Carefully transfer the dissected eye-brain complex to the center of O-ring using a 20 µL micropipette with a 10-200 µL tip. Remove most of the medium and add 12 µL of 0.7% low-melting agarose (at 37 °C) to the sample. NOTE: The position of the eye disc can be changed with forceps before the solidification of the agarose. The agarose will solidify within 5 min. Add 1 mL of culture medium at room temperature to the center of O-ring; each O-ring can load up to 4 samples. Make sure that the agarose is glued to the O-ring to avoid the drifting of the sample. NOTE: No aeration or circulation of the medium is necessary. Place the chamber on the stage of an inverted confocal microscope for 30 min to equilibrate the temperature. This can prevent Z-axis drift during the imaging. Before long-term live imaging, check whether the tissue is intact by differential interference contrast microscopy. To avoid the phototoxicity, use a laser power below 2 mW. Use a 40X objective for imaging. Acquire 62 µm Z-stack images in 12 min at an optical interval of 1 µm. Acquire 40 cycles of scans over a total of 10 h. Ensure that each cycle contains 12 min of imaging and 3 min of resting. In this example, the R3/R4 photoreceptors were labeled with mδ0.5-Ga4 to monitor photoreceptor differentiation. mδ0.5-Ga4 drives strong expression in R4 and weaker expression in R311, making it an excellent marker for R3 and R4, as well as for the process of ommatidial rotation. In Movie 1, R3 and R4 were labelled with GFP. At the beginning of the 10 h live-imaging session, there were 8 rows of ommatidial clusters (Figure 2A and Movie 1) and 14 rows of ommatidial clusters at the end (Figure 2B). The rate of ommatidial differentiation was 1.67 h per row, which is close to the rate of 1.5-2 h/row in in vivo discs 7,8,9,10,11,12,13,14. Based on the relative positions of R3 and R4, ommatidial rotation occurred in the ex vivo cultured disc during live imaging (Figure 2A', A'', B', and B''). A single R3/R4 cluster was labeled with a white sphere in the first frame of Movie 2. In the beginning, the R3/R4 axis appears to be perpendicular to the equator (Figure 2C and Movie 2). It then appears to rotate 15°, 30°, and 45° in 3 (Figure 2C'), 6 (Figure 2C''), and 9 (Figure 2C''') h, respectively. This data suggest that this method can sustain photoreceptor differentiation during the 10 h live imaging. Figure 1: Schematic Diagram of Chamber Assembly. 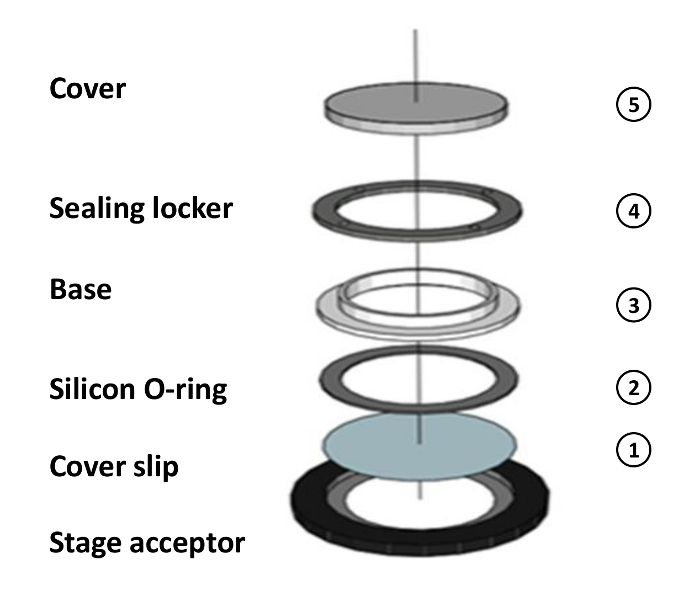 Schematic diagram of chamber assembly: (1) Put the double-layer O-ring-attached coverslip on the stage acceptor. (2) Place the silicon O-ring on the cover slip. (3) Place the base. (4) Lock the sealing locker. (5) Load the sample in the center of the O-ring and place the cover. Please click here to view a larger version of this figure. Figure 2: Live Imaging of R3/R4 Differentiation and Rotation. 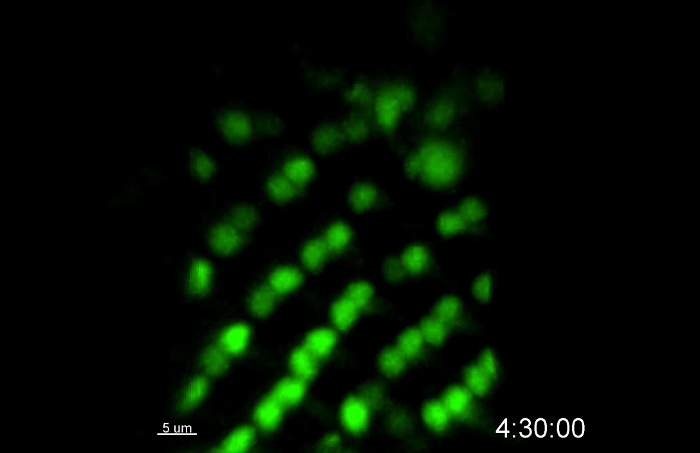 R3/R4 labelled with mδ0.5-Gal4 expressing nuclear-form GFP during 10 h of live imaging. All the figures were captured from Movie 1. (A) Image taken at the beginning. (A'-A") Image enlarged from the boxed area on the left (A') and right (A"). (B) Image taken at the end of the 10 h period. (B'-B") Image enlarged from the boxed area on the left (B') and right (B"). (C-C''') A single R3/R4 pair (marked by an arrow in A') is followed through time to show the rotation of the R3/R4 pair. Scale bars = 15 µm, 10 µm, and 5 µm in A, B, and C, respectively. All the figures are maximum intensity z-projections. The time scale is shown in h:min. Please click here to view a larger version of this figure. In this study, we provide a detailed protocol for a long-term live imaging experiment on Drosophila imaginal discs. We spent a lot of time practicing the careful dissection to avoid disc damage and to allow for the attachment of the disc close to the coverslips. We tried Poly-L-Lysine (PLL) and low-melting agarose to hold the tissue; in the end, the low-melting agarose showed a better ability to hold the tissue. Although only the eye disc was used in this paper to demonstrate the normal occurrence of photoreceptor differentiation and ommatidial rotation during the 10 h live imaging period, this method can also be applied to at least one other disc, the wing disc, as demonstrated in a previous study3. Moreover, the culture medium preparation and live imaging setup are simple and do not require aeration or medium circulation. Continuous live imaging can provide a clear temporal sequence of biological events. In our earlier report of glia differentiation and migration in the eye disc, we provided direct proof that wrapping glia differentiate from existing glia after migrating to the anterior of the eye disc3. Long-term ex vivo culture allows for the specific laser-activated labelling of cells, such as the photo-conversion of the KAEDE fluorescent protein, to follow their behaviors3. 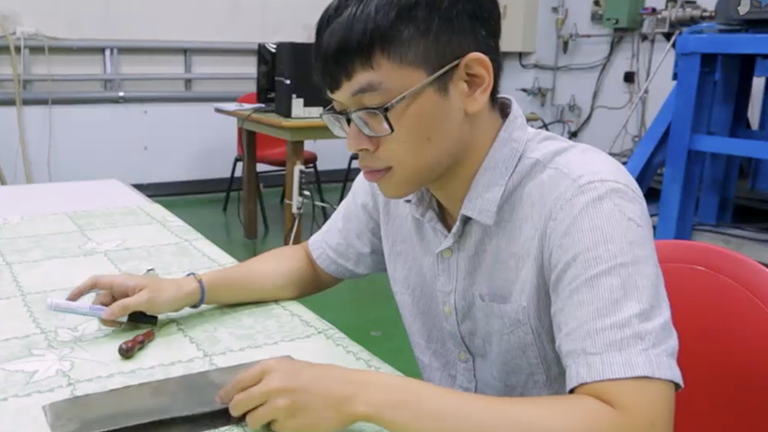 It can also accommodate the testing of chemicals that are added directly to the culture medium; thus, it can be used as a drug screening platform. Since some dynamic process occur within minutes or seconds, high temporal resolution is required. To enhance the temporal resolution, light sheet microscopy15,16 or spinning disc microscopy17 may be a good option. The current culture condition is not perfect. It does not support disc growth. Cell proliferation is only supported for up to 12 h3. After 12 h in ex vivo culture, the rate of photoreceptor differentiation starts to decrease3. This may be due to the lack of certain nutrients or hormones. Since the major difference in this culture medium is the high concentration of insulin, the mammalian insulin may be partially mimicking the function of endogenous insulin-like peptides. The addition of fly extract, the insect blood sugar trehalose, and various concentration of the molting hormone 20-hydroxyecdysone, were not beneficial3. However, the 12-18 h culture period is sufficient to study many developmental processes. Alternative culturing methods for culturing larval imaginal discs have been compared3, and our culturing and imaging condition provides the longest time window and most clarity for live imaging. 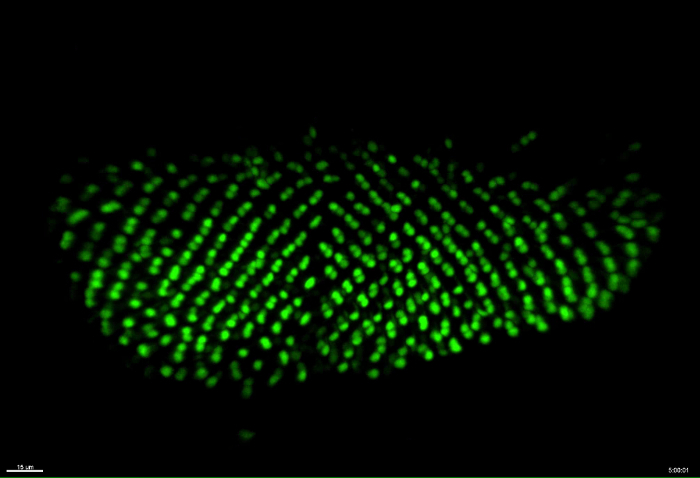 Although discs within live larvae and pupae can be imaged directly18,19,20,21,22, the resolution and time window for observations are limited. Late larval and pupal discs can be cultured for a long time23,24, but the discs undergo significant morphogenesis. To take advantage of the flat, 2D larval discs, our culturing and imaging method is the best solution so far. We are grateful to Chun-lan Hsu and Yu-Chi Yang for preparing the fly food and maintaining the fly stocks, and to Su-Ping Lee and the IMB Imaging Core for their help with the confocal microscopy. This study was supported by grants to Y.H.S. (NSC 101-2321-B-001 -004, NSC 100-2321-B-001 -012, NSC 102-2321-B-001 -002, MOST 103-2311-B-001 -035 -MY3) from the National Science Council and the Ministry of Science and Technology of the Republic of China. Cohen, S. M. Imaginal disc development. The Development of Drosophila melanogaster. Bate, M., Martinez-Arias, A. 2, Cold Spring Harbor. NY. 747-842 (1993). Auerbach, C. The development of the legs, wings and halteres in wild type and some mutant strains of Drosophila melanogaster. Proc. R. Soc. Edinb. B. 58, 787-815 (1936). Tsao, C. K., Ku, H. Y., Lee, Y. M., Huang, Y. F., Sun, Y. H. Long-term Ex Vivo Culture and Live Imaging of Drosophila Larval Imaginal Discs. PLoS One. 11, (9), e0163744 (2016). Ready, D. F., Hanson, T. E., Benzer, S. Development of the Drosophila retina, a neurocrystalline lattice. Dev Biol. 53, (2), 217-240 (1976). Wolff, T., Ready, D. F. The beginning of pattern formation in the Drosophila compound eye: the morphogenetic furrow and the second mitotic wave. Development. 113, (3), 841-850 (1991). Tomlinson, A., Ready, D. F. Neuronal differentiation in Drosophila ommatidium. Dev Biol. 120, (2), 366-376 (1987). Wolff, T., Ready, D. F. The Development of Drosophila Melanogaster. Cold Spring Harbor Press. 1277-1316 (1993). Adler, P. N. Planar signaling and morphogenesis in Drosophila. Dev Cell. 2, (5), 525-535 (2002). Choi, K. W., Benzer, S. Migration of glia along photoreceptor axons in the developing Drosophila eye. Neuron. 12, (2), 423-431 (1994). Strutt, D. I., Mlodzik, M. Ommatidial polarity in the Drosophila eye is determined by the direction of furrow progression and local interactions. Development. 121, (12), 4247-4256 (1995). Gaengel, K., Mlodzik, M. Egfr signaling regulates ommatidial rotation and cell motility in the Drosophila eye via MAPK/Pnt signaling and the Ras effector Canoe/AF6. Development. 130, (22), 5413-5423 (2003). Li, C., Meinertzhagen, I. A. Conditions for the primary culture of eye imaginal discs from Drosophila melanogaster. J Neurobiol. 28, (3), 363-380 (1995). Carthew, R. W. Pattern formation in the Drosophila eye. Curr Opin Genet Dev. 17, (4), 309-313 (2007). Treisman, J. E. Retinal differentiation in Drosophila. Wiley Interdiscip Rev Dev Biol. 2, (4), 545-557 (2013). Huisken, J., Swoger, J., Del Bene,, Wittbrodt, F., J,, Stelzer, E. H. Optical sectioning deep inside live embryos by selective plane illumination microscopy. Science. 305, (5686), 1007-1009 (2004). Keller, P. J., Stelzer, E. H. Quantitative in vivo imaging of entire embryos with Digital Scanned Laser Light Sheet Fluorescence Microscopy. Curr Opin Neurobiol. 18, (6), 624-632 (2008). Winter, P. W., Shroff, H. Faster fluorescence microscopy: advances in high speed biological imaging. Curr Opin Chem Biol. 20, 46-53 (2014). Bosveld, F., et al. Mechanical Control of Morphogenesis by Fat/Dachsous/Four-Jointed Planar Cell Polarity Pathway. Science. 336, (6082), 724-727 (2012). Ghannad-Rezaie, M., Wang, X., Mishra, B., Collins, C., Chronis, N. Microfluidic Chips for In Vivo Imaging of Cellular Responses to Neural Injury in Drosophila Larvae. Plos One. 7, (1), (2012). Heemskerk, I., Lecuit, T., LeGoff, L. Dynamic clonal analysis based on chronic in vivo imaging allows multiscale quantification of growth in the Drosophila wing disc. Development. 141, (11), 2339-2348 (2014). Taylor, J., Adler, P. N. Cell rearrangement and cell division during the tissue level morphogenesis of evaginating Drosophila imaginal discs. Dev Biol. 313, (2), 739-751 (2008). Ward, R. E., Reid, P., Bashirullah, A., D'Avino, P. P., Thummel, C. S. GFP in living animals reveals dynamic developmental responses to ecdysone during drosophila metamorphosis. Dev Biol. 256, (2), 389-402 (2003). Gibbs, S. M., Truman, J. W. Nitric oxide and cyclic GMP regulate retinal patterning in the optic lobe of Drosophila. Neuron. 20, (1), 83-93 (1998). Fristrom, J. W., Logan, W. R., Murphy, C. Synthetic and Minimal Culture Requirements for Evagination of Imaginal of Drosophila-Melanogaster in-Vitro. Dev Biol. 33, (2), 441-456 (1973).